Of all the holidays in one's life, there are few that mean more to so many than the momentous firsts in an infant's initial year. Especially, of course, to you: the parents. There are a lot of firsts, in fact, some of which you've probably gotten to experience! Take, for example, the first crawl or the first little dance. There was, of course, the first nerve-wracking car ride and then the first night home from the hospital. Then there was, unfortunately, the first marathon crying session and the first thrown plate of food—the first bruise, even, from a bottle he or she threw at you. There might be a first favorite food or television show or song or relative (but don't tell the others!). A little one's first Halloween can be a momentous event, especially considering it's likely the first first that warrants a celebratory costume! 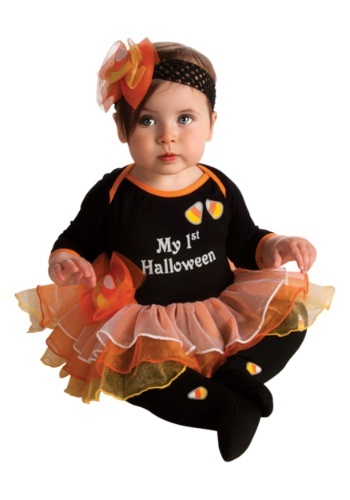 You (and your little one) should celebrate the occasion by dressing her in this Infant My First Halloween Onesie! It's made out of a soft, comfy cotton fabric, the crotch snaps, make diapering easy for you, and "My 1st Halloween" is printed on the front, so everyone can celebrate with you. The pants have an elastic waist with printed candy corn along the legs, and the booties feature padded soles and elastic ankle bands to ensure hard surfaces have little impact on those fragile little feet. Oh, and it's super-cute—making this a first-time at least you won't soon forget!